Outmanned And Outgunned, Libya Struggles To Fix Its Broken Army : Parallels In post-Gadhafi Libya, the militias, not the military, provide security — what little there is of it. Even as world powers lend help, rebuilding the gutted army is proceeding at a glacial pace. Soldiers march during a graduation ceremony for recruits of the Libyan army in Tripoli, the capital, on Jan. 16. The military, gutted by years under Moammar Gadhafi and by NATO attacks, faces multiple challenges as it tries to rebuild. In Libya, disputes are settled by guns. On a recent day, just west of Tripoli, the Libyan capital, gunfire erupts, a battle between two families. It builds for hours; people run for cover. No one intervenes — even though a Libyan army base is just a mile away. Inside that military camp in a town called Zawiya are 230 young men from across the North African nation, part of the government effort to address the country's most glaring problem: an almost nonexistent security force. Three years since the fall of dictator Moammar Gadhafi, Libya remains in crisis, a country with a lot of oil but little security. Most areas are still under the loose control of local warlords and militias. Building a real national military would help solve the problem. While world powers are trying to help with training and equipment, progress is proceeding at a glacial pace. In part, that's because the Libyans are starting from scratch. Gadhafi used to worry that the same force he had used to seize control of the country 45 years ago would ultimately overthrow him. So he gutted the army, which was degraded further by the NATO bombing campaign in 2011 that led to the toppling of his regime. And then weapons stockpiles were looted, sending a flood of guns and heavy weaponry all over Libya. Looking at the army now, there's clearly something missing. There are many older officers, defectors from Gadhafi's army. There are recruits that are barely out of their teens. But there's no one in between. The real force is in the dozens of militias scattered across the country. During an interview at the chief of staff's office in Tripoli, spokesman Col. Ali al-Shekhi lays out the obstacles. "The biggest challenge is the widespread diffusion of weapons," he says. "And there is not much unity, so there are forces that have loyalty to the tribes or areas, and it is hard to break them up." Since Gadhafi's death, security has been franchised out to the so-called revolutionaries who fought him. The government is paying them even as it tries to dismantle them. But the militias don't trust the authorities to share power. Meanwhile, the militias' loyalties are divided. Some respond to the government, others to individual parliamentarians in the opposition. Some are loyal only to tribe, city and self. It's not that Libya is a failed state, analysts and Libyan officials say — it's that the state still hasn't emerged. The elected Congress has done little to build a democracy from the ruins of a dictatorship. It was only last week that Libyans elected the committee that's supposed to write its constitution. The government pays the militias out of fear and necessity, and to keep some influence over them. But that hasn't stopped the armed groups from repeatedly bursting into the National Congress with guns and besieging ministries. The prime minister was kidnapped for a few hours in the fall, and the militia suspected of doing it is one of many actually on the government's payroll. 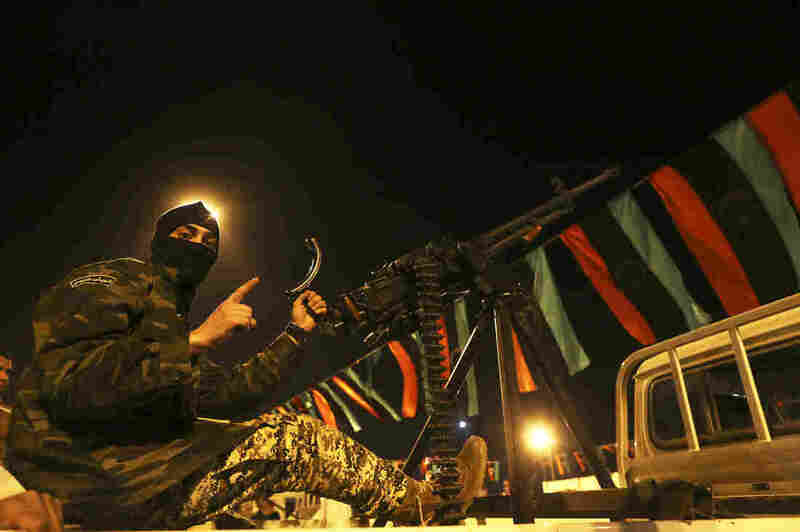 A member of a heavily armed militia group is seen with his weapon in Freedom Square in Benghazi, Libya, on Feb. 18. Many of the militias are actually on the government payroll. When asked how big the Libyan army is right now, Shekhi says he doesn't know. The ministry pays at least 180,000 people, but many of those salaries are for members of Gadhafi's old army; the actual number is just a fraction of those forces. Down the hall from Shekhi's office, military officers talk to British consultants — apparently military liaisons — about training. A video plays on the TV showing militia members, wearing mismatched military uniforms and carrying rocket-propelled grenades. It's security footage from inside a local TV station that has been critical of militias. It was raided the night before, ransacked and attacked with RPGs. The whole incident was caught on security cameras and broadcast on air. It's unlikely anyone will be arrested. The officers watch nonchalantly and flip the channel. It's the same story with the police, who are ill-equipped and unable to rival the weapons on the street. Libyans live through abductions and shootouts daily. Defense Minister Abdullah al-Thani says the army is in the "beginning of its inception." "It has been systematically marginalized and dismantled for over 42 years by the Gadhafi regime," he says. The embattled government is pinning its hopes on the new so-called General Purpose Force. The plan is to send about 20,000 men abroad for training with the help of Turkey, Italy and others. Libya has asked the U.S. to train 6,000 to 8,000 of these men. 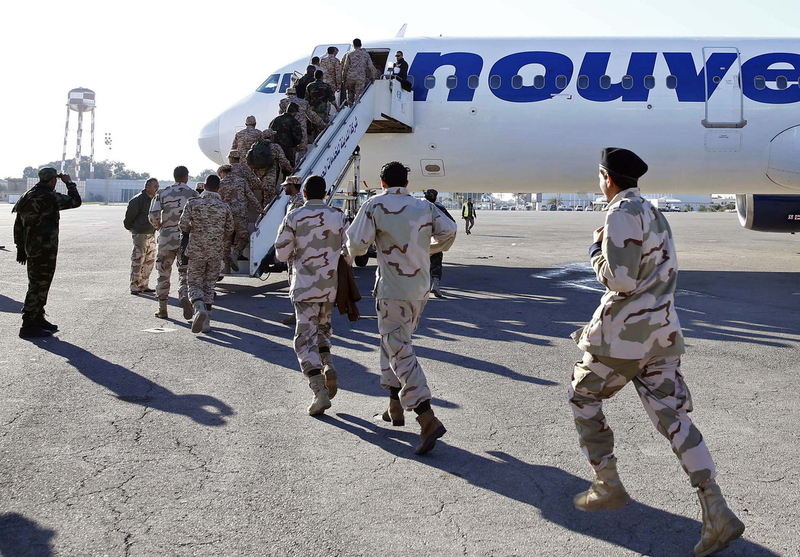 A batch of former rebels who have joined the Libyan army board a plane in Tripoli on Jan. 9. They were headed to Italy to receive training. But Thani says there are so many hurdles. Many young trainees are being sent overseas to get them away from families and tribes. 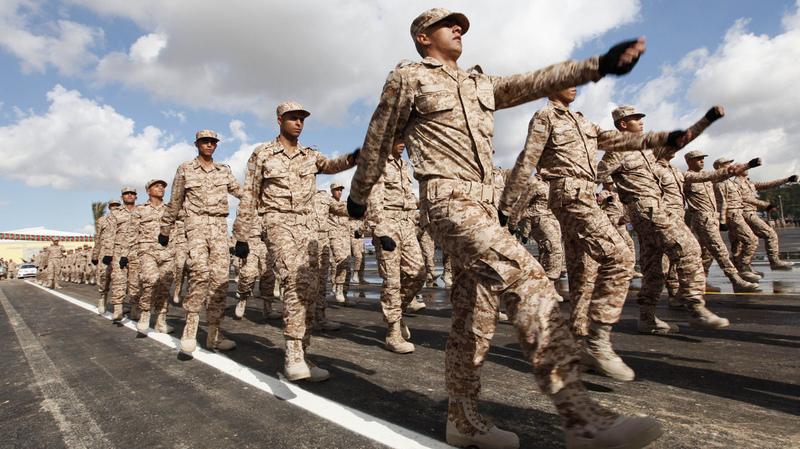 The Libyan military also hopes to train 10,000 men domestically each year. This is all taking place as the state continues to try to integrate militia members into the security forces or back into civilian life. So far, this effort has largely failed and remains the most difficult task. "As soon as they are assured the state is strong and the army is strong, they will hand over their arms and return to their affairs," Thani says. "But Libya is going through a difficult phase with many challenges." It will take five to six years for things to improve, Thani says. "The world wants Libya to [become] a state between a night and a day," he says. "That's impossible." 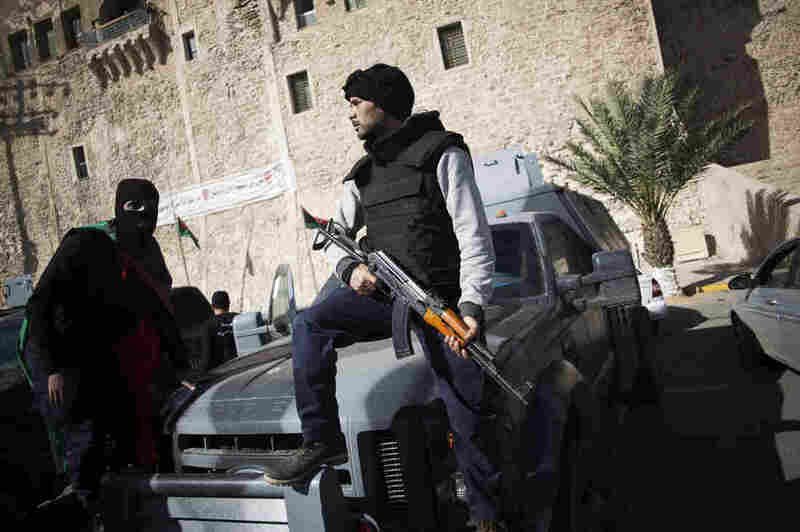 A member of the Libyan police special forces holds his weapon as he and another stand atop a vehicle at Martyrs' Square, also known as Green Square, in Tripoli, on Nov. 21. 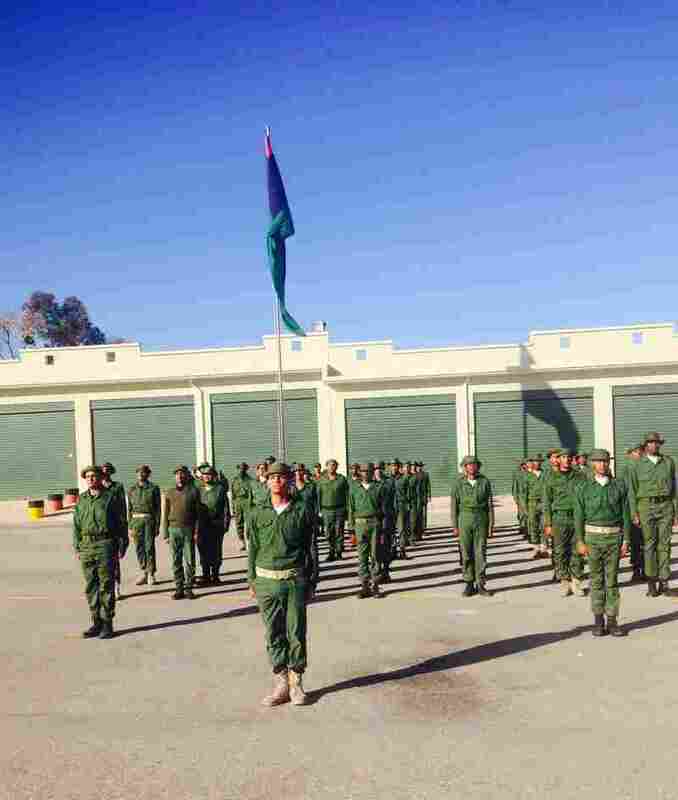 Back at the military base near Zawiya, the young recruits march proudly through an asphalt parking lot to the beat of a drum, saluting their aging Libyan instructors. Destroyed tanks and walls riddled with bullets surround them, relics of the civil war that followed the uprising against Gadhafi's abusive regime. Col. Mustapha Saleh is the lead trainer in this small military camp. The men live here for five months in the hopes that the training will forge a loyalty to Libya rather than region, tribe and ideology. Outside, a ferocious gun battle breaks out once again. On the side of the road, a woman quickly pulls her children from school and speeds off. As the gunfire gets louder, there are no security forces to be seen, so young men from the neighborhood lean over a fence and direct traffic away from the fight. The battle started when someone was killed and his family sought revenge. This is how disputes are settled in Libya; for now, the only kind of justice is the vigilante kind.